Global countertop demand is forecast to rise 2.3% yearly through 2021. Solid surface and engineered stone will see the fastest growth, especially solid surface, which is often utilized in rapidly rising developing markets, leading to faster growth than in laminates. Nonresidential countertop demand will pose faster growth in both remodeling and new markets. The developing Asia/Pacific countries will post the fastest regional growth, while developed markets with already-high countertop penetration rates will see somewhat slower growth. 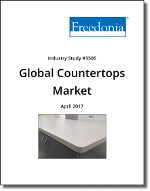 This Freedonia industry study analyzes the countertop market worldwide with historical data plus forecasts for 2021 by material (solid surface, laminates, natural stone, engineered stone, and others), market (new and remodeling for both residential and nonresidential buildings), and type (kitchen, bathroom, others) in 6 world regions and 18 major countries. This study also assesses the market value in dollars, evaluates company market share, and lists industry players including Caesarstone, Cosentino, DuPont, Fletcher Building (Formica & Laminex Group), Lotte Chemcial (LOTTE Advanced Materials), Shandong Hefeng Group, Wilsonart International, and Zhongxun New Material.